We’ve rung in the New Year, the winter holidays behind us, and allowed ourselves a few moments to breathe. But, with February right around the corner, Room Parents are likely gearing up for one of the more favored class parties of the year; Valentine’s Day. In my experience, Valentine’s class parties tend to be on the smaller scale. That said, you can still ensure the kids have a memorable time by following these guidelines. A good class party involves three basic ingredients: a craft, a game or two, and a treat/snack. If there is time, you could include a story, or an interactive song that fits with the theme of your party. I always suggest you get in touch with your teacher first and find out the basics: party time frame, rules regarding goodie bags, and if they have any specific details they want included. Once you have the basics figured out, you can incorporate your plan. Note: Just make sure you leave enough time for the kids to exchange their Valentines. 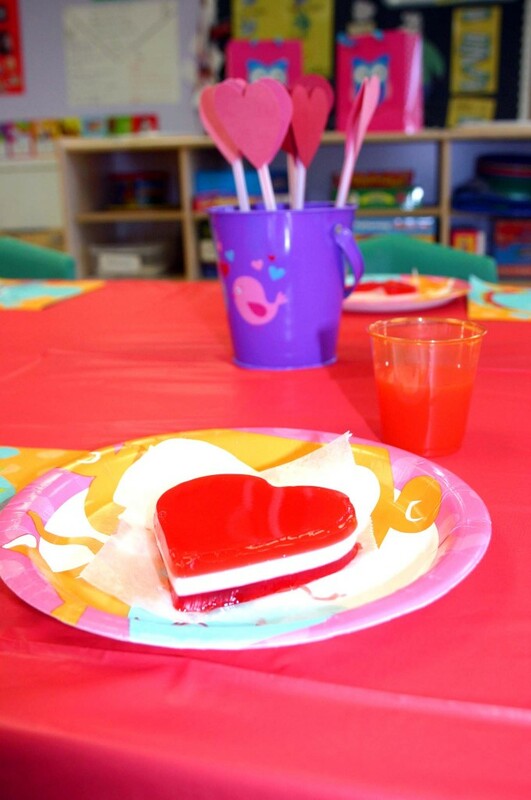 Now that you have all the elements to plan a good party, here are a few of my favorite ideas to help make your Valentine’s class party a success. 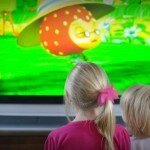 Games that keep kids moving, or better yet, learning will be your best bet. Minute to Win it – A popular game amongst kids based on the hit game show. Basically you come up with various challenges for the kids to complete before the clock runs out. TALLEST TOWER: each child stacks candy hearts, one on top of the other. If it falls, they must start all over again. The one with the tallest tower at the end of the 60 seconds is the winner. DEFYING GRAVITY: in groups of two, each team must tap 3 balloons to keep them from touching the ground. If your balloons fall to the ground you are out. The last team(s) standing at the end of 60 seconds is the winner. 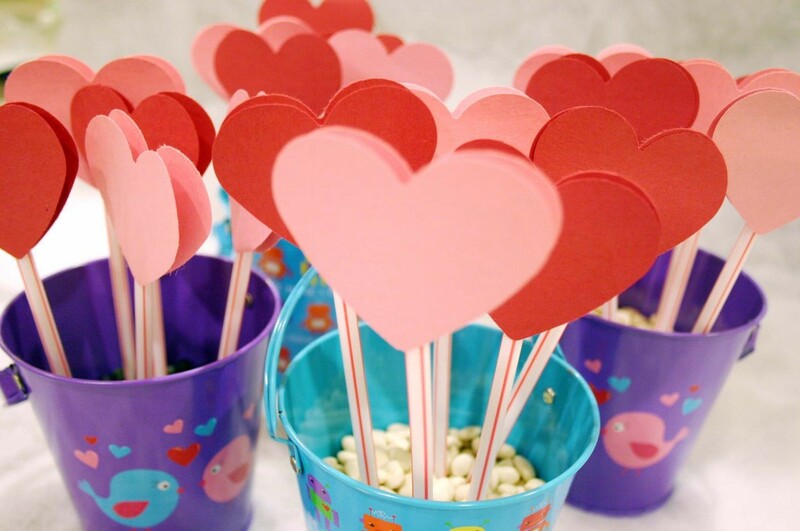 CHOPSTICK PICKUP: Using conversation hearts, place a handful in a bowl for each child. Then give each child an empty bowl and a pair of chopsticks. Each child must move all their hearts from one bowl to the other, one at a time, using only their chopsticks. For Preschool and Kindergarten, tweezers can be used instead of chopsticks. Valentine’s Day Mad Libs – Who doesn’t remember creating the hysterical mad libs stories when they were kids? Better yet who doesn’t love creating these funny stories? Elementary School kids will love putting this story together. If you aren’t familiar with mad libs here is how they work. Two players have a story, but it is missing key words. Player one asks player two to tell him a word (adjective, noun, verb, etc.) and enters them into the appropriate blank spots (numbered). The results are hilarious. You can download the one I created here or create one yourself. If you want to create one yourself, here is an easy way to do it. Depending on the target age, grab a book, magazine, or short story. Pick a paragraph and write it down. Then highlight a variety of nouns, verbs, and adjective that are important descriptors in the story. These are the words you will remove. It is best to have between 10-20 words removed from the story. Draw a line in their place and indicate what part of speech that word represents below the line. Voila, you have your very own Mad Libs. All Paired Up – Punch, or cut, out hearts from red construction paper. Then cut them in half. On one half of the heart, write numbers 1-25 (or whatever number you need) with a magic marker. On the other half, draw dots, place stickers, etc. of that number. Pass out the heart halves to each child. They then have to find their perfect match, matching up the written number to the number of objects/dots. Variation #1: use letters. Write the uppercase letter on one half and the lowercase letter on the other half. Each child must match the lowercase to the uppercase letter. Variation #2: using numbers again, write the numbers on one half of the heart. On the other half, write the word of the number. This helps with early readers. Variation #3: for the older grades you can use equations. On one half you would write an addition, subtraction, or multiplication problem. On the other half you would write the answers. For example: “9×3” would be written on one half and “= 27” would be written on the other. Sight Word Pop – For this game you will need empty Pringles cans (decorated to fit theme) and slips of paper, or large popsicle sticks. Write sight words the children are currently learning on the slips of paper, or one end of the popsicle sticks. Make one of them a special word fitting the theme. For example: Heart, Valentine, Love, etc. Fold the pieces of paper and place them in the can, or place the popsicle sticks word side down into the can. Kids sit in a circle and each take turns picking out a piece of paper/stick. They must read the word. If the child gets the word correct he keeps the the paper/stick and passes the can on to the next child. If they don’t know or get it incorrect, they then pass the word to the next child who gets a chance to read it. This continues until someone gets it correct. However, if you get the special word (our examples are: Heart, Valentine, Love) you have to put all your words back into the can. The goal is to be the one with the most words at the end of the game. Variation: for the younger ones in Preschool you can either write the letters A-Z (uppercase, lowercase, or both), numbers, shapes, or place an image (feelings, places, objects, animals, etc.) on the paper. If the child correctly identifies the letter, number, or image they get to keep it. If they pick out the image of a heart, or a puppy holding a valentine, or something along those lines, they put all their sticks back. Marble Painting – this is fun for all ages, but really helps with motor skills in the Preschool-Kindergarten range. I use foil bake pans that I bought at the dollar store, because they have deep sides to hold everything in. Cardboard boxes work just as well, However, I find that the foil pans are not only cheaper, but smaller for individual use in large groups. Next you will cut paper to fit the bottom of the pan in the shape of a heart. Then squirt nickel sized drops of paint, in colors red, white, and pink (or light blue, yellow, or green for boys). Drop in about 5-6 marbles and let the kids tilt the pan in various directions, spreading the paint across their paper. This will give them a Jackson Pollack type look. The best part, they can then give these to their parents as Valentines. 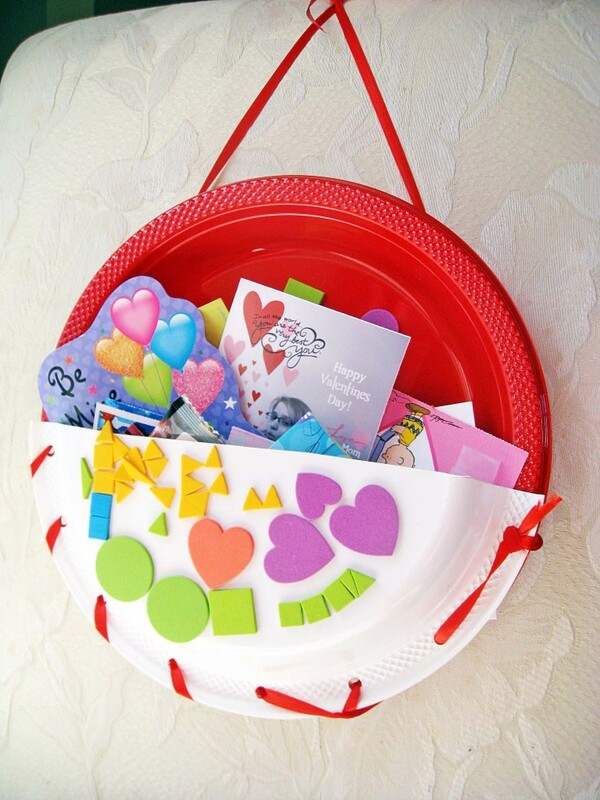 Valentine Holder – for this craft, you will need plastic plates, ribbon, a hole punch and stickers. Use two plastic pates, or paper plates, in red/pink and white for each child. Cut one plate in half and lay backwards on top of the other plate. This creates a pouch. (Note: the other half can be used for the next child. So you would only need half the amount for one color. Example: for 18 kids, you would need 18 red plates and only 9 white plates.) With the plates one on top of the other, you will punch holes all around the edges till you reach the top of the full plate. Cut ribbon twice the length around the plate. I highly recommend that this all be done ahead of time. Once at school, have the children thread the ribbon through the holes starting at the top and ending back at the top. Use the tails to tie together, making the handle. Lastly, have them decorate it with stickers. Now they have a lovely pouch to carry all their Valentines in. Heart Hanging Garland – for this project you will need pipe cleaners in red, white, and pink (maybe a baby blue or yellow for boys), some beads in various colors, and ribbon. First, have the kids thread some beads onto three pipe cleaners. Then, have the kids shape the three pipe cleaners into hearts. (note: little ones might need a little help with this). Next you will want to attach the heart to each other. You do this by cutting small strips of pipe cleaner and wrapping it around the bottom of one heart and the top of another. Do this twice. When you get to the top of the first heart, instead of pipe cleaner, you attach ribbon by tying it in a knot. Leave enough slack for a loop and tie the ends in a bow. Now you have your hanging heart garland . It’s a really cute craft to bring home to Mom and Dad. A Beary Sweet Valentine – for this craft you will need the following: 2 brown dessert paper plates, brown card stock, beige card stock, red/pink card stock, 1 inch round paper punch, 2 inch round paper punch, small heart punch, 3 inch scallop punch, black sharpie or other marker, and goggly eyes. NOTE: I recommend punching out and pre-cutting all the items needed to assemble. It saves a lot of time. First you glue the upper rim of one paper plate and press it to the bottom back of the other plate. Take 2 pre-cut arms (should be a long oval shape) and 2 pre-cut legs from the brown card stock and glue them to the back of the bottom paper plate. Take 2 pre-punched ears (2 inch punch) from the brown card stock and glue them to the back of the top plate. Take the pre-punched 2 inch circle from the beige card stock and glue to the front of plate. This will be the base of the nose and mouth. Take two pre-punched circles from the red or pink card stock and glue them to the face on opposite sides of the beige circle. Take the pre-punched small heart out of the red or pink card stock and glue it on top of the beige circle. This is the nose. Take your sharpie or other marker and draw a mouth starting at the nose and making a u shape to the left and again to the right. It should form an upside down m.
glue on two goggly eyes. take the punched scalloped circle from the beige card stock and write a message to your parents, sibling, etc. Glue this to one of the hands. Or, you could cut out a bigger heart and write our message on that, and glue it to the front left of the bottom plate. Either way it turns out supper cute. Give to your parents, sibling, etc. as a Valentine. Cookie Decorating – this craft is aways a lot of fun. Especially since you get to eat the result. Pre-bake enough heart shaped sugar cookies for the class (with some extras in case there are siblings at the party). Then compile the decorating elements. I suggest using two or three different colors of icing. For example: white, red, pink. Put them in bowls with plastic knives or spreaders. Then get various sprinkles in Valentine colors such as: sugar crystals, jimmies, heart shaped ones, etc. Put them in separate bowls with spoons. Have enough supplies for three or four different tables depending on the size of the class. Then let the kids get real creative decorating their cookie. The best part is that this craft can double as your party snack/treat. First and foremost, I must reiterate the importance of talking with the teacher and finding out what food allergies, if any, are in the class. This will help in decided what snack to make and ensure that ALL children are included in the festivities. I know most parties tend to go with the trusty cupcakes, but I find that it gets old and how much sugar do we want shoved down our kids throats during the holidays? They will be getting enough candy through Valentines so why not have a snack that is a bit heather and even a bit more creative, though just as tasty. Below are a few of my favorite snack ideas. I made this treat for my son’s preschool class a few years ago, it was a big hit and super duper tasty. I do recommend making this the night, or day, before though. Dissolve one package of flavored gelatin in 3/4 cup of boiling water. Add 3/4 cup cold water. Pour the mixture into a 9×13 inch glass pan and refrigerate about 1 hour. Stir together 1/2 cup of boiling water and the condensed milk. In a separate bowl, dissolve the unflavored gelatin in 1/2 cup of cold water for 1-2 minutes. Thoroughly mix in 3/4 cup of boiling water. Combine this mixture with the milk and let it cool. Add half the mixture to the pan of red gelatin, pouring it over a spatula to slow the stream. Refrigerate for about 20 min. Mix the second and third packages of flavored gelatin per instructions above and alternate layers – gelatin mix, milk mix, final gelatin mix- chilling in-between each for 20-30 minutes to set. Once set make individual servings with a heart shaped cookie cutter. Refrigerate over night and serve the next day at the party. Break the graham crackers into squares or rectangles. Chill for 30 minutes. This will cause the crackers to soften and become more like cheesecake crust and the topping will firm up. Serve. Or, you can serve them without chilling and they are just as tasty. Trust me, this is one of my favorite snacks with the kids. Alternate strawberries with cubes of Angel Food Cake onto a cookie stick (skewers might not be allowed in schools). These can be made two ways. This isn’t exactly healthy but it is an easy alternative to cupcakes. Option #1: Cut out pieces of bread using a heart shaped cookie cutter. Spread Fluff marshmallow onto bread. Top with a strawberry half. Option #2: Cut out pieces of bread using a heart shaped cookie cutter. Spread Fluff marshmallow onto one side of bread, spread strawberry jam onto the other side. Place two pieces of bread together and serve as finger sandwiches. These are just like make Rice Krispies treats, only you are using popcorn instead. Melt the butter in a sauce pan over medium heat. Stir in the marshmallows, vanilla and salt. Stir constantly until the marshmallows are completely melted and the mixture is smooth. Place the popcorn in a large mixing bowl and pour the marshmallow mixture overtop. Toss gently to coat the popcorn. Allow to cool just slightly before you form them into balls. Best to do with well buttered hands. Place on sheets of wax paper, sprinkle if desired, and allow to set. Once firm, insert cookie stick into each popcorn ball. Tie a festive ribbon (red, pink, one with hearts, etc.) in a bow. Serve on cupcake liners. 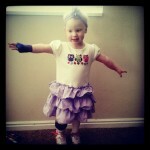 I hope I left you with enough ideas to feel confident about your Valentine’s class party. If you have any questions or need clarification on anything, please don’t hesitate to ask me by leaving a comment below. Happy planning! I am currently a Stay at Home Mom of 2 wonderful kids. Before I had kids I worked as a Photographer and then a Contract Administrator. Now I spend my days being a room mom, managing my daughter's food allergies (peanuts and tree nuts), and overseeing homework. I have discovered a joy for running, having completed five 5K races, and have a whole new outlook on being fit and staying fit. Because of my daughter's food allergies, I have taken up cooking from scratch and find that it is not as hard as I imagined. I still enjoy curling up with a good book (am in search of a good book group), creating things (whether it be handmade cards, themed parties, holiday decorations, crafts for school, gifts for friends and family), and photographing and documenting our daily lives through scrapbooks and my blog, Unscripted.